It's time for a new challenge. Create a card using polka dots. Hooray. Challenge closes: Wednesday 17th February 2010. 62. Piali 63. Gloria M. YAY!!! You Know I'll be PLAYIN!!!! I just love polka dots... I will be back! Oh how fun!!! Hope you are recovering from your birthday and housewarming bash! Bet it was fab!! I, too am a fan of polka dots!! I made a card for a class I'll be teaching that just happens to be very "dotty". Happy Belated Birthday, so sorry I'm late with the birthday wishes. Hope your day was as sweet as you are! SO FUN!!! Thanks for all of these great challenges, Lucy!! Hmmmm.....I wonder if I can play? You think?? I'm starting to see spots already!! Oops, sorry I missed your last challenge! Maybe I will have time for this one! I just posted my second try in this new fun challenge. Thanks for the opportunity and all the inspiration. You make me do my first card this year! I just love polka dots too. This is my first ever entry for a challenge, so I hope you like it!!! I love this challenge Lucy! But at this point I can't see Mr.Linky.I think the tool is down! I also don't see Mr. Linky today....the system is down? I'm leaving my card link here and may come back to add to Mr. Linky later. PS: FYI I used Vicky's DH's device Inlinkz for my challenge. I'm very happy with it. They provided me GREAT support whenever I need help. Thanks for inspiring, and thanks for these fun challenges! Love polka dots. Just happened to make this and then saw your challenge! Yay! Love your cards Lucy...so inspiring. Thank you for another awesome challenge, Lucy! Love polka dots!! Thanks for the challenge Lucy. As you have inspired me so much, (you will notice by the card), I just had to enter. Dang! I missed the deadline! I still had LOTS of fun playing along! Thanks for the challenges, Lucy. You're the best! I love polka dots, but usually think of them as too cute for most cards. Your card for your hubby inspired me to use them in a masculine card. Thanks! Hi Lucy! 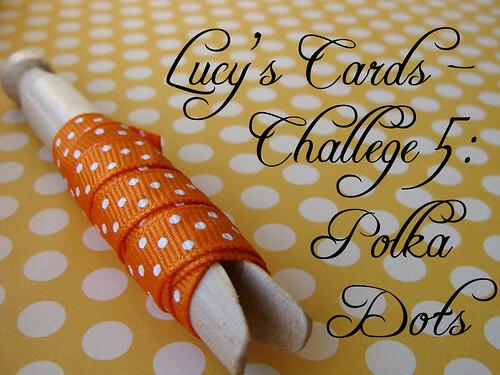 I FINALLY linked a card to your polka dot challenge! Hope I made the deadline....Actually, 90% of my cards have dots on them so I used the last card that I made. A little cheeky card! Thanks for a great challenge! Hi Lucy! I hope it's OK that I've entered twice?! If not feel free to delete my second entry but I really am on a Polka Dot kick at the mo!